Welcome to Business Cards Dublin, a website designed to show you how your business card can work for you to help you promote your company. Our experience in helping companies in Dublin and nationwide create a business card with a strong selling message, impactfull graphics and also printed in the highest quality and finished with a long lasting mat lamination at great value and very fast turn around time. We found the service provided by Outsource Graphix to be second-to-none, from initial contact all the way through the design phase and after sales their attention to our details was outstanding. We found them to be working for us with our best interests at heart. 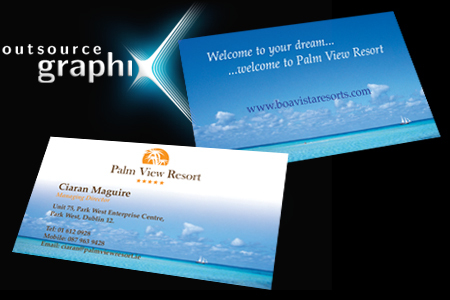 From Business Card design to brochure creation they are truly 100% professional. We design professionally designed business cards that you just won't get with out the help of very talented designers who know what it takes to turn a small piece of card into a business card that will work as a marketing tool for your company. We have designed and printed business cards for companies such as Kilsaran Group and Kilsaran Lifestyle, The Digital Hub, Nike Teamwear, Nike Golf as well as many other large companies, many small to medium sized companies, collages, organisations and many startups based in Dublin and nationwide.